Be picked up from your cruise terminal and begin our shore excursion to this charming Shanghai international metropolis, scenes of many hollywood movies like Missions Impossible 3, Looper and Skyfall. First visit the Yu Garden, a representative of south China classic gardens, built in the Ming dynasty, over 400 years ago. The Chenghuangmiao bazzar close to the garden is a interesting place to hunt for some local things. Then come to the Bund. Stroll on the Bund, you will be impressed by the 50 various style foreign buildings of the city’s colonial period. 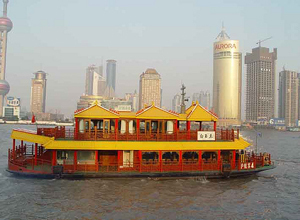 Embark on a one-hour cruising on the Huangpu River, a must for first time visitors to enjoy the city views on both sides of the river. Finally, ascend the Jinmao Tower, the 3rd highest building in the world to have a panorama of Huangpu River, the Bund and the city of Shanghai. Be transferred abck to your cruise terminal after the tour.